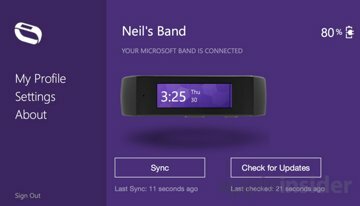 We've spent a few weeks testing out the Microsoft Band, which is compatible with Apple's iOS and also has a dedicated OS X app for syncing. 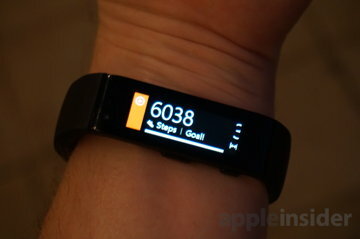 The Band sells for $199.99 through Microsoft, and it is available in sizes of small, medium and large. 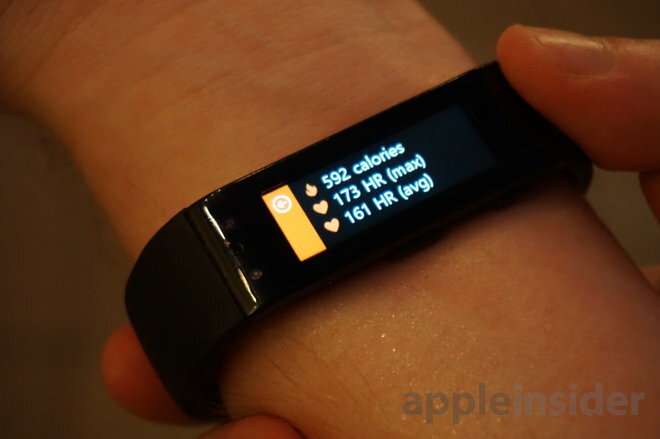 Microsoft Band is compatible with Apple's iOS, via a dedicated Microsoft Health app available free on the App Store. The company also has a less-fully-featured app for OS X, available on the Mac App Store, that allows users to charge and sync. While it offers a range of basic smartwatch functions, the Microsoft Band is first and foremost a fitness and health tracking device, offering step tracking, heart rate monitoring, sleep monitoring and more. But for us, the key feature was GPS integration, allowing the Band to track our outdoor runs without the need to use our iPhone's GPS, or even carry our iPhone with us. The design of the Band is very much a first-generation device: It's chunky and feels like a work in progress. But the Band is bulky for a reason, as it packs in a great deal of sensors and capabilities that do make it an appealing health device. The top of the device sports a 1.4-inch touchscreen that measures 11 millimeters by 33 millimeters, with a resolution of 320 by 106 pixels. Given its long rectangular design, content must be displayed horizontally across the display, which makes it best suited for displaying inside the wrist. We don't usually wear watches in this fashion, but found ourselves able to quickly adjust. Wearing the Band is not necessarily unpleasant, but we did find it to be slightly uncomfortable at times. Thankfully, adjusting the tightness of the Band is easy with a unique slide-locking clasp on the underside. Inside the wrist-worn accessory is a sensor that can actively track a user's heart rate throughout the day. And opposite that, underneath the display, is a magnetic charging port. When worn for a long period of time at moderate tightness, we did find that this port would leave an indentation on the skin on the inside of our wrist. 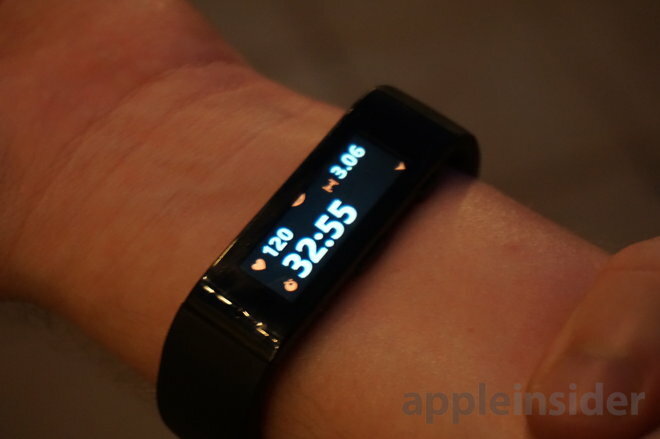 Beyond heart rate, the Band can also track steps and movement, skin temperature, ultraviolet light, and more. 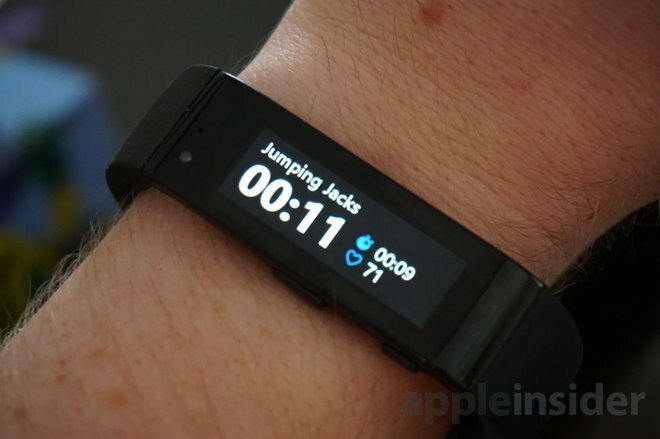 Including all of these sensors makes the Band rather stiff, which some wearers may find unappealing. We'll also note that the Band was advertised to come with a free screen protector, but when we bought ours at a Microsoft Store, no protectors were available. Over the course of a few weeks' worth of use, we did manage to get some noticeable scratches on the display. 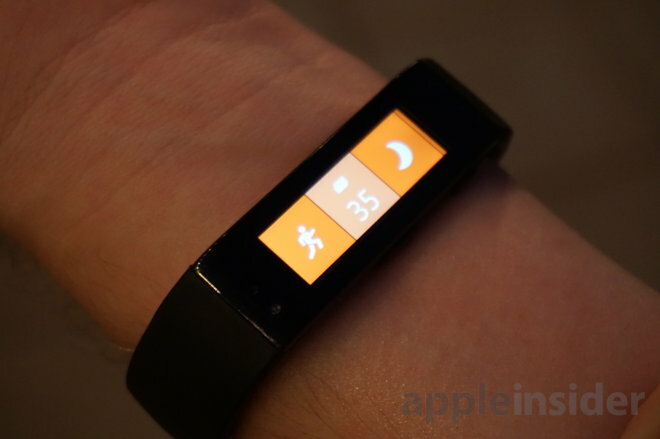 The design of the Microsoft Band is frankly its least appealing aspect. Users who don't mind its style or comfort level on the wrist will find its greatest assets in daily usage, where we found the Band to be a viable entrance into the wearables market. The Microsoft Band is not intended to be a do-everything smartwatch, and this device doesn't feel positioned to compete with the Apple Watch or even Android Wear hardware. Instead, Microsoft is focusing on the fitness market, where companies like Nike, Garmin, Fitbit, Jawbone and others compete. The collection of features and sensors in the Band help it stand out from other devices, which may only track steps or heart rate. The Band not only does both, but also offers built-in GPS, calorie tracking, sleep tracking, goal setting, a UV monitor, and a unique selection of guided workouts that we found particularly interesting. 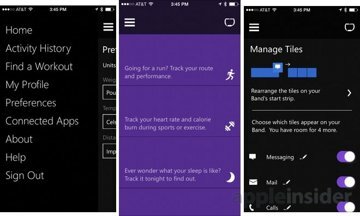 Navigating the Microsoft Health app for iOS, users can install custom workouts and routines onto their Band. For example, a basic routine might have a user working out three times a week. Once this routine has been selected, the Band would alert users on days when they must work out, whether it's strength training or cardio. For these workouts, the Band will even walk users through every step of their routine, using a combination of display and buzzing alerts. For example, a bodyweight workout routine would have users to jumping jacks, squats, planks and crunches, and alert then with a buzz when to start and stop. For more advanced fitness enthusiasts, guided workouts from Gold's Gym are available. The Gold's Gym workouts are 12-week plans created by celebrity trainers, focusing on a variety of goals from building muscle to losing weight. 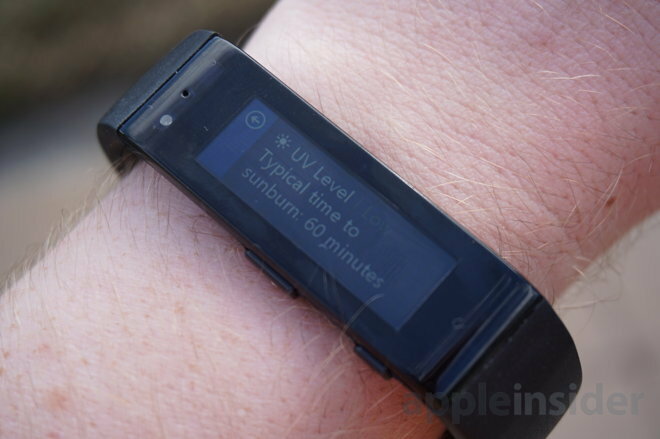 And the inclusion of GPS is a true killer feature for the Microsoft Band. Testing the Band inspired us to dig up our old clip-on sixth-generation iPod nano, using that for music on our runs and negating the need to lug around an iPhone 6 on our arm. Once returning from our run, we simply opened the Microsoft Health app on iOS and synced the activity, which was then automatically uploaded to our connected RunKeeper account. The Band shares time, pace and distance data with RunKeeper, but unfortunately not route data on a map. GPS does come at a cost, though: While Microsoft says the Band can last up to two days on a single charge, we found that battery life was significantly reduced if we tapped into the GPS. For example, in our tests, a one-hour outdoor run cut the battery uptime to just over a day. Currently, the Band also supports integration with MyFitnessPal, and Microsoft has partnered with Starbucks to allow users to pay with their coffee chain card via a scannable display on the Band's display. One gripe we would like to see fixed: Some sort of auto-enable for the display when bringing the watch toward your face, like Apple's upcoming Watch. As it stands, activating the screen to simply check the time requires a button press. 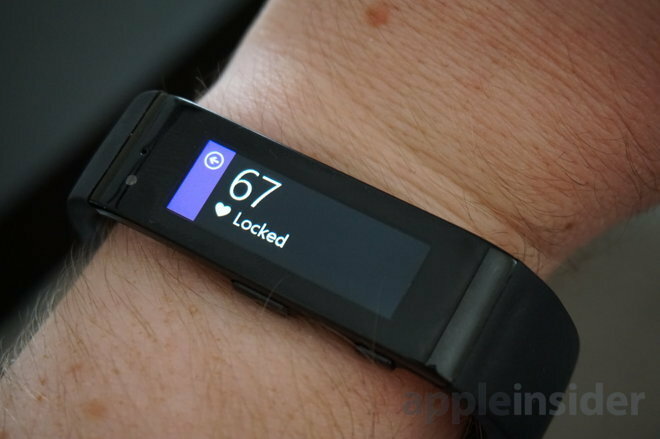 Still, the Microsoft Band has a strong lineup of features for an ambitious first-generation device, and it's clear that there's much more to come —particularly on the iOS front. 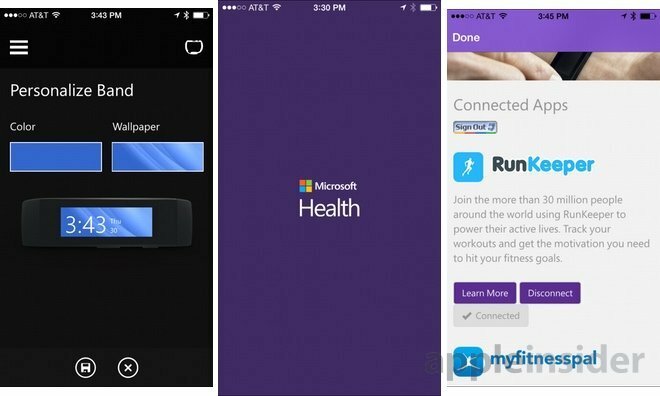 While the Band does not yet work with HealthKit, Microsoft has told AppleInsider that it does plan to integrate support for Apple's Health application in iOS 8. This will make it even easier for data collected by the Band to be shared with other apps and services, which will serve to only bolster the value of the wearable device. 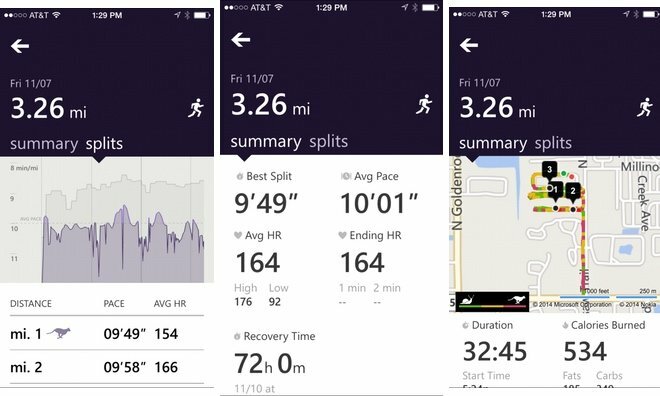 For now, without HealthKit support, Microsoft's integration with RunKeeper and MyFitnessPal go a long way in making this a viable fitness tracking device. But we are looking forward to more universal ecosystem support once HealthKit begins to really take off. Syncing, setting up workouts, and customizing the look of the Band through the iOS app are all simple and easy. For the smartwatch functions, major apps like Messages and Facebook get dedicated tiles that can be enabled or disabled, while users who want all notifications from all apps sent to their wrist can allow the Band to do so. Applications are displayed on the Band as tiles, with three at a time fitting across the display. Users can customize the order of these tiles, or hide them completely. The color scheme and wallpaper of the Band can also be configured through the iOS app. 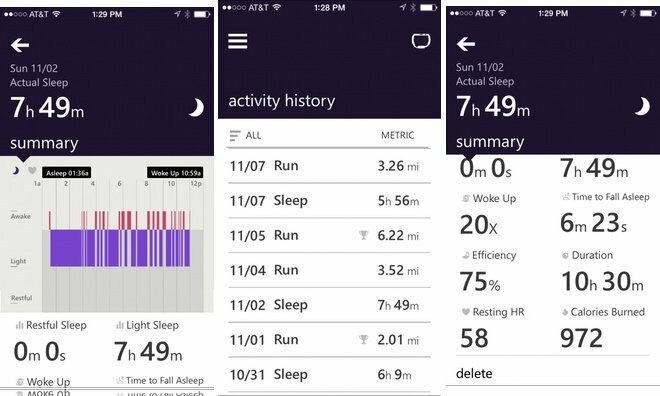 The Microsoft Health app also allows users to review their recent activities, including runs, exercises, and sleep patterns. These are accompanied by helpful data and well-designed graphics, including maps for runs, and illustrations for restful sleep, light sleep, and time awake. Microsoft Health feels comprehensive, detailed and useful. 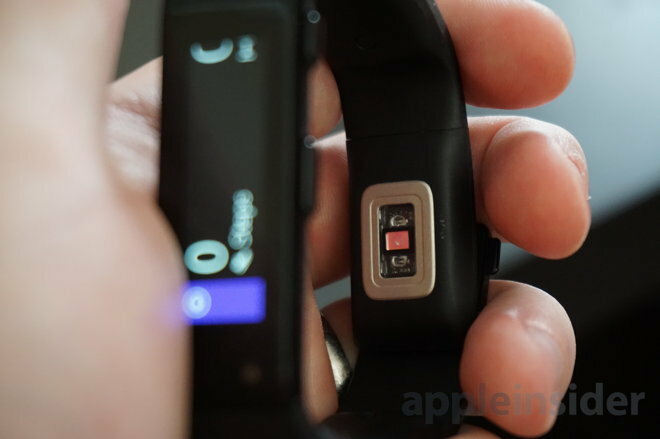 The tracking capabilities of the Band and the out-of-the-box support for Apple's iOS make the Band a strong candidate for anyone considering a fitness-focused device. 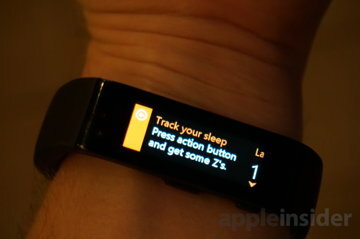 As an iOS-connected smartwatch, the Microsoft Band falls flat, offering just basic alerts and vibrations. The unit also includes a microphone, but this only works with Windows Phone devices and is incompatible with iOS. 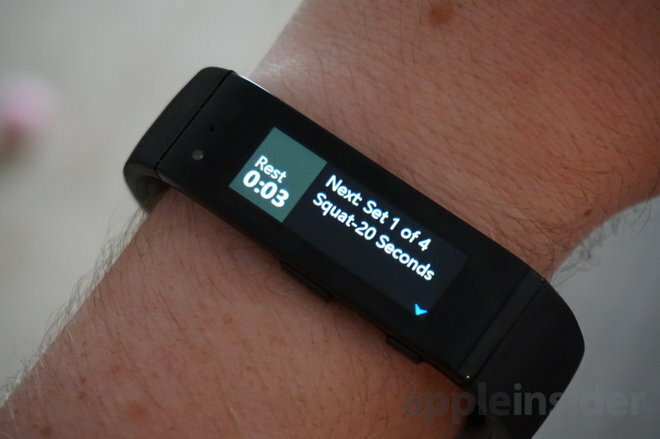 Priced competitively at $200, the Microsoft Band is clearly not trying to go after the same market as the Apple Watch, or even Android Wear. This is intended as a fitness and health device, and it's very much first-generation hardware, with a clunky design that may not appeal to all. In the space it occupies, competing with products from Jawbone, Fitbit, Basis, Nike and others, the Microsoft Band offers enough to stand out. 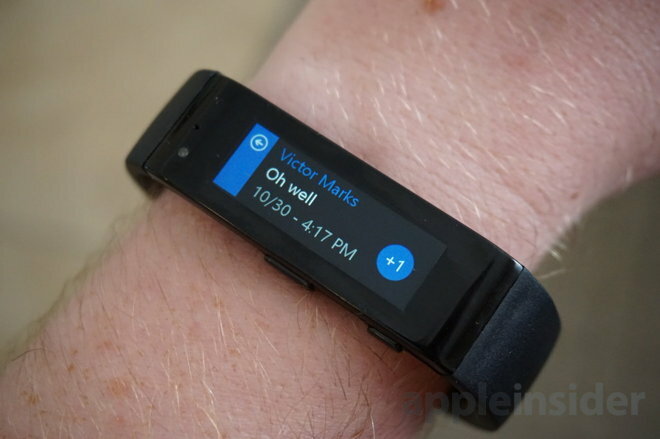 Anyone currently in the market for a wearable fitness tracker should definitely consider Microsoft's offering. In many ways, Microsoft Health feels like the star of the show, tapping into the hardware features of the Band to offer a wide range of health and fitness data. 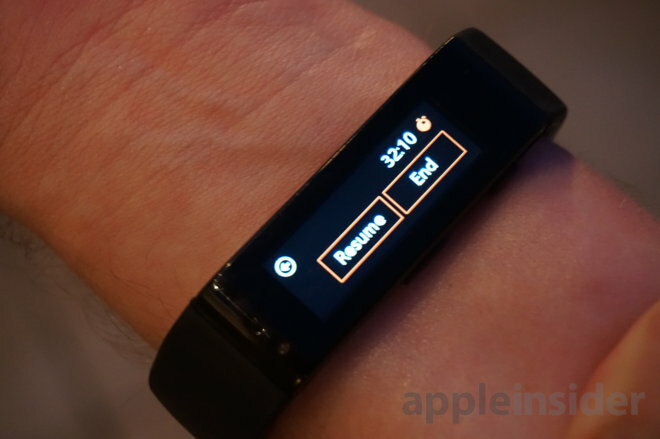 This, along with the deep day-one compatibility with iOS, only bodes well for the Band and future wearable fitness accessories from Microsoft. Of course, those looking for a more full-featured smartwatch should wait. Regardless of how well received the Apple Watch is when it launches in 2015, few could dispute the likelihood that the wearable devices market is about to get shaken up in a big way. But a $350-and-up multifunctional wearable device isn't for everyone, and that's where the Microsoft Band carves its niche. As a first-generation product, it's a respectable entrance into the wearable market that seems to signal even better things to come. 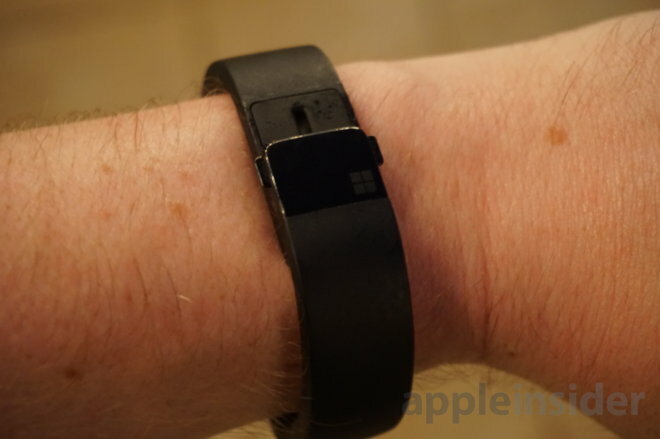 The Microsoft Band is available direct from Microsoft from its online store and its retail locations. All three sizes sell for $199.99. It comes with a $5 Starbucks gift card and is supposed to come with a screen protector (though ours did not).